Bruno is a purebred Bernese Mountain Dog we rescued on Christmas day. He was 10-months old and a pretty tall guy for his age, but very underweight. He came from a home that was not prepared to raise a growing Berner boy. He lived with his foster family for several months so he could be neutered and have corrective eyelid surgery. He got along very well with his two human foster brothers. He was a little timid around men when he first came, but quickly developed strong bonds with everyone. A family in New York adopted Bruno in early March. They renamed him Raleigh. 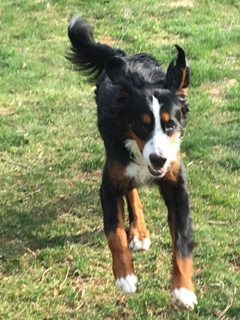 Raleigh joins canine sister, Summer, another rescue Berner, and they have been enjoying running and playing in his new 2 acre backyard. He will also be spending time up in his Vermont home on 37 acres. I was out in the yard cutting and pulling down large vines that were taking over one of our evergreen trees. I was struggling with this very thick vine. Just couldn’t pull it down by myself. All of a sudden Raleigh runs over to me, grabs the end of the vine and gives it a good tug and between the two of us we were able to pull the vine down. My husband watched in amazement. He helped me with two other vines too. He actually knew he was helping me. Raleigh has gained 20lbs since joining his new family and is loving life! Theo is a 7-8 year old Berner who we pulled from a kill shelter near Asheville. Not knowing much about him, his new family picked him up and took him back to South Carolina. They reported that Theo appeared quite neglected and started his new life anxious and cowering in the pantry. His nails were so long, he had difficulty walking and he had an abscess in a cracked molar that hindered his ability to eat. He needed to gain weight and was sad and disengaged. Theo received a thorough exam and a lot of care from his new vet. His abscessed molar was extracted and a growth removed from his eyelid was thankfully benign. He began eating more and started to gain weight. He is now very engaged with the family, often placing himself at the center of the action. His new mom says "He now barks when the door bell rings and when any of us walk through the door, he runs to greet us with his tail wagging which is incredibly gratifying! He even accompanied us on a Spring Break road trip to NY and did outstandingly well". The family's 12 and 15 year old boys are just as invested in Theo’s recovery as their parents are, with the entire family celebrating every little milestone of progress and appreciating the rewarding feeling that comes with rescue. 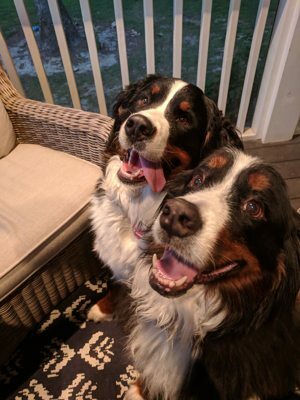 Theo joined Lili, a 1 ½ year old Berner and they are hoping he learns to play with her. This is the family's first rescue and Theo's mom says they are deriving more than Theo from this experience! 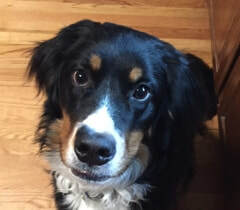 Copper was a 10 month old purebred Bernese Mountain Dog who was surrendered to the club by her family, who realized an energetic, large puppy can be a lot to manage. Copper was quickly rehomed to a family in South Carolina. She has been renamed Meekah. Meekah has two human children, two other dogs and one cat to play with. She has gotten very comfortable in her new home, surprising her family by asserting herself as the alpha of the pack. Meekah is the family's first Berner.